A City Hall proposal for some quick fixes to traffic safety issues on Fountain Avenue got the support last night of residents whose longtime concerns were heightened in September by the death of a local resident who was hit by a car while crossing the avenue. 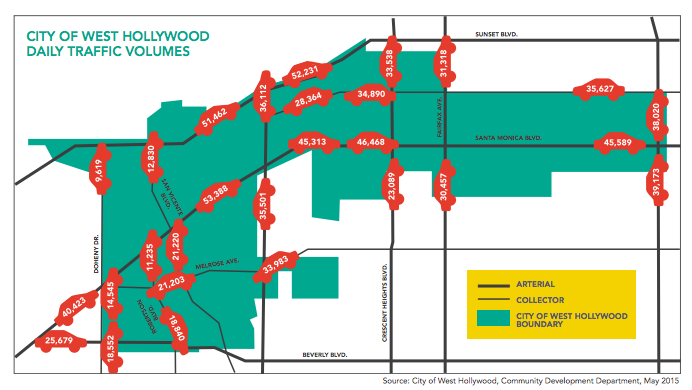 The proposal, presented at a community meeting at Plummer Park, called for implementing variety of measures focused primarily on the intersections of Fountain with Harper Avenue, Havenhurst Drive, Hayworth Avenue and La Brea Avenue. Those intersections were chosen based on the number of collisions there and the city’s ability to implement fixes relatively quickly. Hany Demitri, West Hollywood’s acting city engineer, said he expected that work could be completed this summer if the proposals are approved by the City Council when it reviews them next month. 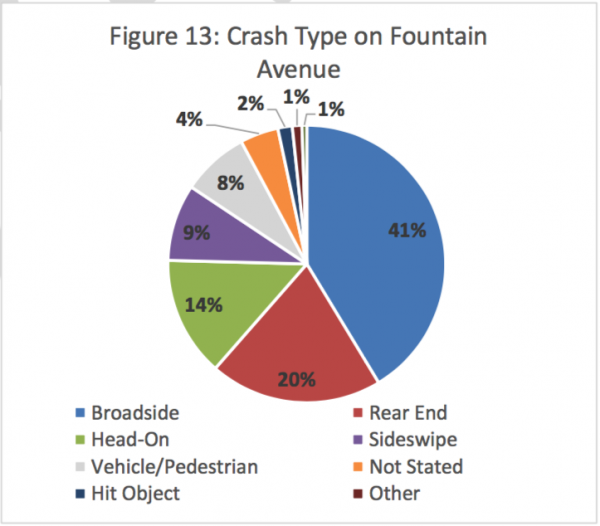 A study of traffic accidents on Fountain from 2012 to 2016 determined that 41% of the 179 collisions were “broadsides,” meaning one vehicle crashing into the side of another as a car attempts to cross Fountain from a side street or make a turn onto it. The next largest number (21%) involved rear end collisions, and 14% were head-on collisions. Demitri said an average of 35,000 cars each day drive along Fountain. Many of the immediate measures are intended to reduce those broadside collisions by reducing the number of left turns made on Fountain from intersections without stop lights. A map illustrating those collisions shows that they constituted 32% of the 179 total collisions between 2012 and 2016, with most of them involving vehicles headed south toward Fountain. –Installing a median on Fountain at its intersection with Harper that would make it impossible for drivers headed north or south on Harper to turn left onto Fountain. –Installing signs on Havenhurst and on Hayworth alerting drivers that only right turns are permitted onto Fountain. –Adding a right turn lane on Fountain on the west side of La Brea Avenue and extending the length of the left turn lane on Fountain at La Brea so that cars wanting to turn left don’t impede those heading east across La Brea. Also, on Fountain just east of La Brea, the city would remove some parking space and create a “bulb out,” which effectively reduces the width of Fountain and thus would slow cars headed west across La Brea. Other pedestrian and traffic safety measures include installing islands in the middle of Fountain that make it easier for pedestrians to cross at intersections like Flores Street, installing a left turn light at the northbound intersection of Crescent Heights Boulevard with Fountain, and putting crosswalks with lights signaling that pedestrians are crossing at intersections such as Orange Grove, Havenhurst and Harper avenues. Several residents at the meeting congratulated the City Hall staff for the work it has done on those proposals and gave the staff a round of applause at the end of the meeting. No one offered “yes” as an answer to that question, but Bianca Siegel, the city’s Long Range and Mobility Planning manager, said the city wants to make Fountain appear more pedestrian friendly to drivers, who then would be less likely to see it as a place to drive fast. Walter Davis, West Hollywood’s neighborhood traffic management program specialist, said the city will study the effects of the short term changes as it begins to institute the intermediate and longer term measures. Among those measures will be efforts to improve the walkability of sidewalks along Fountain, parts of which are very narrow or somewhat blocked by power poles and fire hydrants. Other measures include changing some stop lights to give pedestrians priority in crossing the street before cars can move forward, more crosswalks with lights signaling that pedestrians re crossing and installation of medians or curb bulb-outs that will slow traffic. Davis said the City of West Hollywood also has begun talking with the City of Los Angeles about traffic safety measures that can be implemented on the north side of Fountain Avenue. The north side of Fountain from North Fairfax Avenue to La Brea lies within the Los Angeles city limits. Davis said the city hopes to have a schedule developed for the intermediate and long term measures soon. Lt. Edward Ramirez of the West Hollywood Sheriff’s Station said it has stepped up enforcement on Fountain in recent months, with more of a police presence there. For example, Ramirez said, officers on foot patrol nearby are asked to park their vehicles on Fountain in the hope that the presence of Sheriff’s Department cars will cause drivers to drive more slowly. Traffic citations on Fountain Avenue, which totalled 600 in 2014, fell to 497 in 2015 but then climbed to 654 last year, Ramirez said. He said those citations do not include warnings given to drivers whose actions were not so egregious as to warrant a citation. What about a road diet? I don’t hear bicycles mentioned at all. I’m a cyclist who lives on Fountain and never ride my bike on this “bike route” making it difficult to get home. I’ve been harassed, almost hit, and spit on by motorists. It’s time for two lanes of traffic with a center turning lane and dedicated bike lanes. Let’s Get out of each other’s way so ALL traffic can move safely. It’s hard to envision without a graphic of the changes, but I applaud the changes recently made on Santa Monica west of La Cienega. I think for the first time the other day I was able to travel from San Vicente to Orlando without having to stop once. The new turnouts heading north, and requiring both pedestrians and vehicles to stop and go by lighted signals make driving through that area significantly better — with greater safety for all. How about signs and the Sheriff Deputies to enforce this while awaiting remedies? We might eventually get a reputation for a safe driving city. A comment was made at the meeting that enforcement is “as much as is able.” The deputies themselves don’t think they have enough manpower. The correct description would be Fountain as a thoroughfare in a residential neighborhood — not a residential street. It compares with Sunset through Beverly Hills or Beverly Blvd through Hancock Park. I disagree. Sunset in Beverly Hills is massive. Beverly Blvd in Hancock Park is also. On Fountain there are thousands of residents and people walk on the narrow sidewalks on the edge of the street. Fairfax to Spaulding has no place to cross and the lights are timed so there is always traffic. This street does not need to be a residential thoroughfare. It needs to be safe for those of use who live here and use it. I agree with you, Don Azars, on the signs. Since I don’t have a light on Hayworth, I go around the corner to Laurel, where there is a traffic light. How much extra time? A couple of minutes, maybe. If I remember correctly, one of the last accidents on Fountain was somebody speeding through a light on Laurel. Orange Grove Ave. is only 1 block from Fairfax. Why can’t people walk that block to get to a crosswalk? Why must a new crosswalk and stoplight be installed just 1 block away? It seems like a waste. Are we that lazy? Are that many people crossing Fountain at that point and for what purpose? There is nothing there! Slowing and reducing automobile traffic is key- great to see that prioritized and supported! The safer and more appealing it is to walk and bike the more people will choose those options- leading to fewer cars and safer streets. Fountain..a quiet residential street? Really? How’s that for naivety! Fountain, like Melrose and other cross-town streets, carries a lot of traffic. This has always been true and will continue to be. While we may like to think our little town of Weho is insulated from the rest of the world, we have to recognize that we are part of the greater LA region. We want, even encourage, people to come here so there will always be traffic. Fountain needs help and it looks like it is going to get some. It will be interesting to see if it will be done by summer. We’ve been waiting on all those plans for Melrose for years and the truly residential streets in West Hollywood West have been promised all kinds of “traffic calming” measures and so far have only gotten a few bollards which does very little to displace the traffic to the streets that can better handle it. LA has placed signs reacting to cars speeding. If they go over the limit (35) lights flash and say “SLOW DOWN” – sound infantile but it works. WE NEED SIMILAR SIGNS on Fountain Ave. I’m a victim of a wreck there….so I speak out of experience.